Happy Dia de Los Muertos, Halloween, & All Souls Everyone!!! 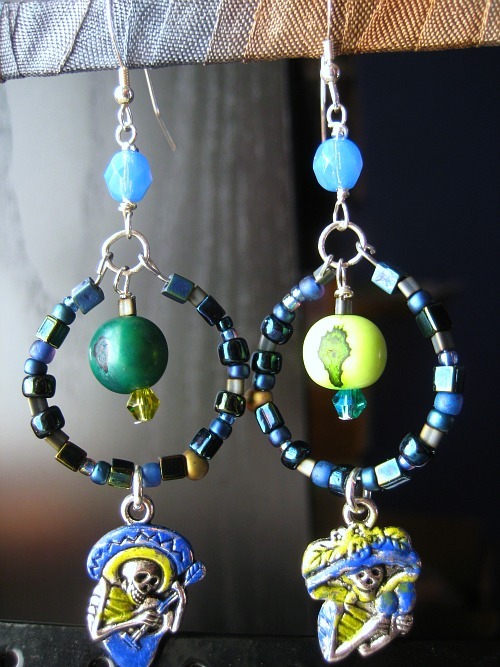 I’m hosting a jewelry Giveaway for a pair of Day of the Dead painted charm and sterling silver earrings below. Happy Dia de Los Muertos, Halloween, & All Souls Everyone!!! 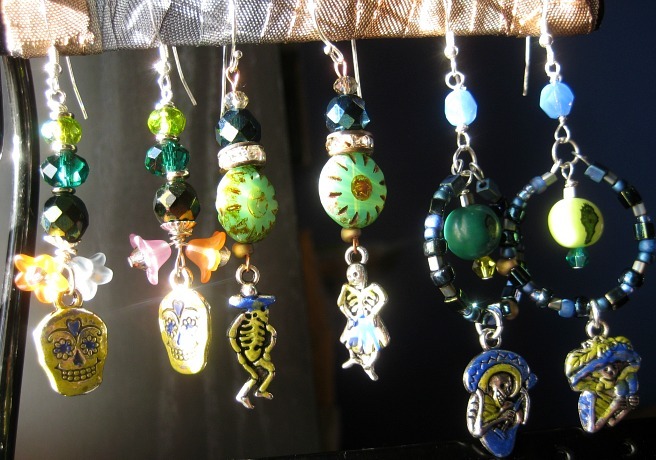 I’m hosting a giveaway for a pair of Day of the Dead painted charm and sterling silver earrings below. 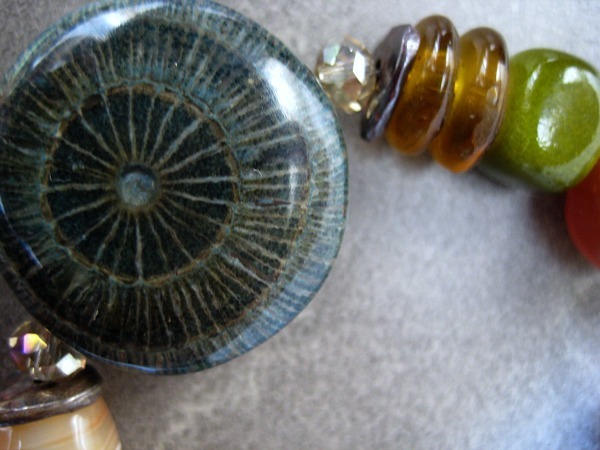 But first, check out this cool Gulian vine bead from the Philippines. Huge, wood, dyed and lacquered. I am trying to find out what kind of plant it comes from… anyone know? I think it may also have grown in Kamala’s garden, thus the Buddha pendant… more on that soon. 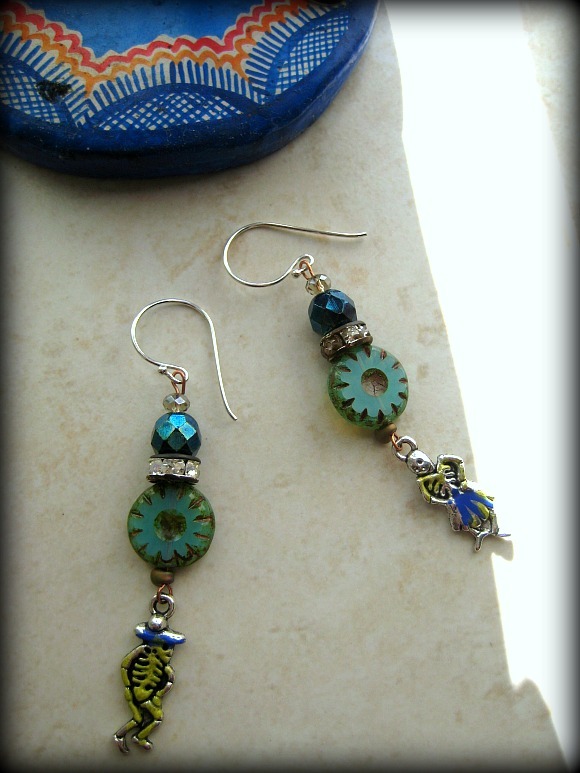 I’ve moved from the fall color palette to blingy with color and crystals. And am finally inspired to start experimenting with embellishment; something new for me; like the finish on the little Buddha charm above, or Vintaj metal treatments to these cool silver metal charms. I am still a sterling silver/gold vermeil purist- but for now, these Day of the Dead charms are too fun to pass playing with. Festive Music. It’s Marina of fancidevices, er her designs and tutorials, that are inspiring me to take more risk. 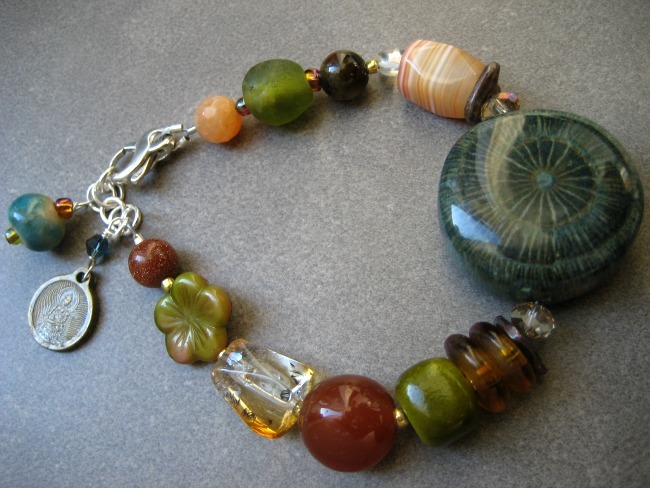 There is a spontaneity to that grrrl’s jewelry designs that puts me in awe- even though our materials and styles are nothing alike, and I don’t alter finishes or rework materials much (too hooked on bling!). But the originality of her compositions draws me in- as if each piece has been on a long journey and we just happened to be in the right time and place to find it, whether in a museum, or digging it from the dirt: each piece fascinates that way. But I’ll crush on Marina’s work, and her tribal, victorian, assemblage world later as I get into her tutorials. For now- it’s her creative output that’s got me hooked (addicted!) to her blog. That and her crazy fun, dark, LOL humor. Check her out- and (she’s having a sale now). 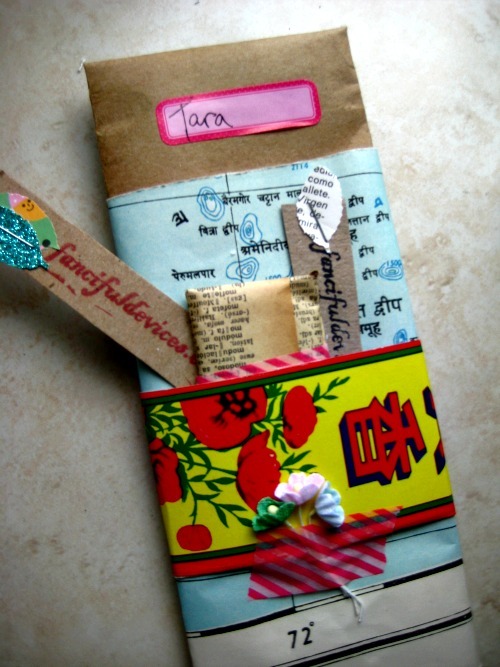 Her packaging is a world unto itself- nautical maps…Hindi advertisment papers, DNA like octogons cut from children’s books…wow. 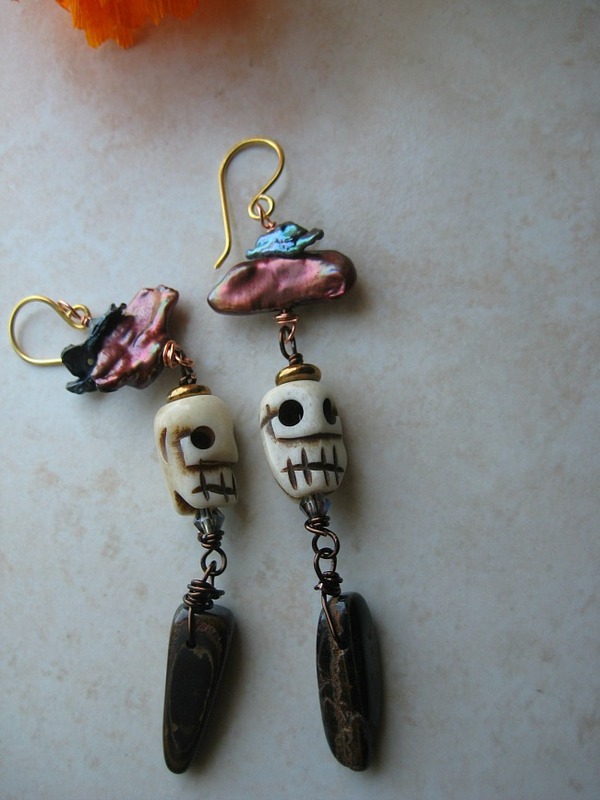 And you KNOW of my long time Artists Crush on Charlene of Black Mud Studios: Her stonewear sugar skulls this year are the BEST, and I won’t stop working with them any time soon. Holidays or not. 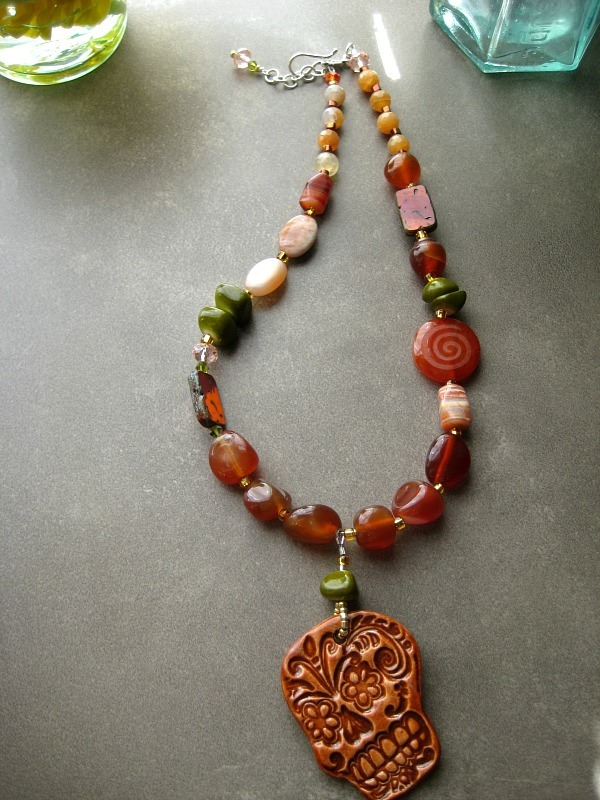 Inspired by Fall Migration colors of Monarch butterfly. And a gold/vermeil wire-wrapped chain version-More colors to come. To win them- leave a message on this blog post saying what you think of the Day of the Dead holidays. (All opinions welcome- but NOTE: kids visit too- so nothing rude). Also- be sure to put your e-mail (soo many of you don’t have links back to your blogs, email, or contact info- even on your avatars. Make sure I can reach you!) Open to everyone- international customers welcome. “She studied the mauve plain. This and more inspirations from poems, book bits, quotes are getting posted along with jewelry pieces in my shop Three Muses on etsy. 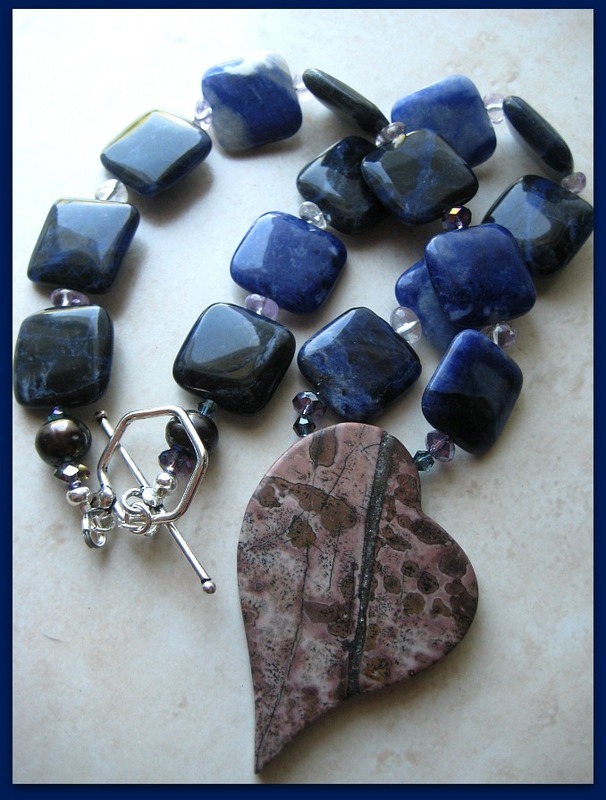 Love your jewelry…do you also ship to the Netherlands? Wow, Tara! 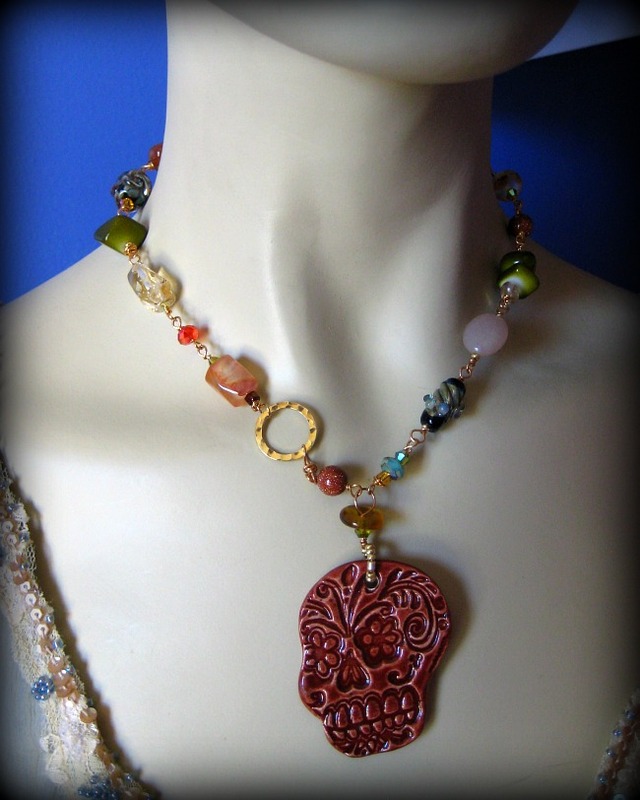 You create this gorgeous jewelry in addition to singing and performing?! What a talented and energetic lady! I grew up in the northeast part of the country and didn’t know of Dia de los Muertos until I moved to the bay area 32 years ago. We don’t have much in our culture in the states that speaks either to death or our ancestors. These autumn days, when the veil thins between the worlds, is the time to remember, honor, and celebrate our loved ones who have gone before us. It was probably the calavera figures seen on one of my first trips to Mexico that caught my fancy. I loved how they remind us that death is really our constant companion, even as we go about our day-to-day life. Lively and meaningful ofrendas brought back real memories: her Pall Mall cigarettes, his favorite song played over and over… And the beautifully artistic altars whose symbols inspire further imaginings of life and death. Dia de los Muertos provides us the perfect opportunity to connect and remember in a loving way, with joy as well as the tears. It’s wonderful how it’s become part of my annual observance in the bay area! aww! thanks for the plug and for showing a pic of my overthetop packaging. what a fun blog you have here. This year I did my first ofrenda. Our celebration was peacefull healing for my family who had recently lost an uncle. The children got a deeper understanding of our culture and traditions. I love all your calaca jewerly. I was painted myself for this Halloween. I enjoy your blog and your are truly blessed with creative outlets. Thanks for sharing.